I want to preface something. I love Instagram. Like love it so much that I have to set time constraints on it via the new handy-dandy Iphone “Screen time” update. Instagram feels easy to me. Especially now that we have IG Stories, I feel like I can finally live out my dream of having my own reality TV Show (sheepishly half-joking, half serious–we all mourn the way Nick and Jessica turned out)! And truthfully, I know people in the online business space are annoyed that it seems to be all curated and fluffy nowadays, I….kinda like the curation part of it. Makes me feel all artsy and strategic. But I like pretty things. I have built and small and mightily engaged IG following. I love my peeps on the ‘gram. So much so that I kinda sorta forgot about my other audience… Facebook. Like an old high school friend that didn’t go to the same college as me, who didn’t party with me on the weekends, who wasn’t in my sorority. I neglected to nurture it. Until, I realized something. Facebook is a loyal and faithful friend. People LOVE, love, like REALLY love to hang out with Facebook. It’s steady. And versatile. And popular. Do you like analogies, ornahhhhh? Ok, so here’s my point: Facebook is VERY much alive and well. And with the lure of Instagram and Youtube and other platforms that are super fun and engaging and whimsical- we sort of forgot about Old Reliable. AND WE ARE DUMB FOR IT. But friends, there is redemption. You can still return, apologize and move on. Like any good friendship. You see, if we forget about Facebook, we are leaving potential money on the table. Like I said earlier, we all love the ‘gram, and that’s fine and good, but the two platforms have pretty different audiences. IG tends to cater to a younger crowd, while FB users are a “twidge” older. And “twidge” is actually a word I made up because as I look at the statistics, I see that my age demographic is considered more in the FB crowd and I feel slightly wounded and recall the old “You’re only as old as you feel” adage and in this case, I will stick with a comfortable and firm 27. I was told pretty intently by a few powers that be over the past 18 months that Facebook is dead. Then, I started hanging with other powers that be and they said, “What?!! No it isn’t, you just aren’t USING IT WITH STRATEGY.” And I think the latter group is right. There are 1.5 BILLION active users per day. PER DAY. All the prefaced information said, this is the point of my post- If you are in the online business/marketing/sales space. 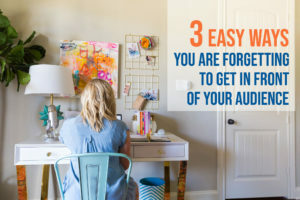 There are 3 easy ways you might be forgetting to get in front of your audience. I’m going to break them down for you here. There is nothing new, in fact, it is probably just stuff you FORGOT because you have been so swept up in trying to use the ‘gram and grow your following there. Fine. Keep doing that too! 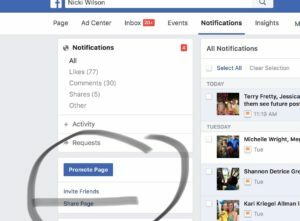 BUT dust off your FB BIZ page (yes, you need one-do not post biz stuff on your personal page) and GET IN FRONT OF YOUR AUDIENCE SO YOU CAN SELL! Inviting people. Yep. You heard me correctly. The simple invite to “like” your page. Now listen, all ye studious people, DO NOT INVITE ALL. The people you want to invite are the people who are interested in your business. 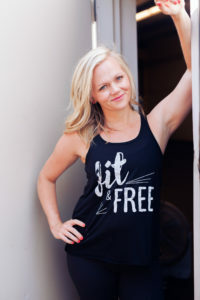 If you are a female-only service company with a niche market between 32-44 years old, then invite THOSE women. Find this to be so simple surely, it is ineffective? *insert maniacal laugh here* Seems like it, but it is most definitely not! These people are friends who already like you, so target the ones who are going to BENEFIT from you!! Go invite 30-40 people right this second, girl!! 2. Engaging people. 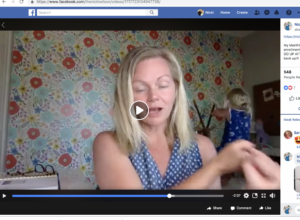 The reason people got all down and out on FB business pages was because it seemed like a rat race to make sales on them. EVEN FB ITSELF GOT SICK OF IT! They started threatening businesses that they would all but shut them out if they did not quit spamming and selling! You guys, sadly, I was one of these people. I only showed up on my page when I was launching. Whhhhaaaaaa. Then wondered why no one was listening. No one was listening, because no one was listening, heck, probably no one was even SEEING anything to listen to! Treat your page like a place to hang out with your friends. Hate to say it, but more like IG! Engagement is how the algorithm lets your page be heard. And I don’t mean fake stuff like, “comment yes if you showered.” No, no, no, I mean ask things that you & your peeps actually care about. Make it of 1.) Value to your audience. 2.) Authentic to who YOU are which allows people to know you more and 3.) Doesn’t seem spammy and lame. And I wish I could say there was a magic formula to post everyday, but this is where YOU get to be an investigator and do the work. You might have to post funny memes. Or pretty inspiration Jpegs. Or maybe you treat your page like a talk show and just GO FOR IT! Additionally, LIKE and Comment on EVERY SINGLE PERSON’S COMMENT annnnnnnd keep the conversation going if you can because this little piece of unicorn poop does 3 magical things: 1.) Boosts algorithm (“hey! people really like this stuff she is putting out! look how much they are talking about it!” 2.) Makes you not look like an a**hole. Why would people want to comment if you are going to ignore them? 3.) Immediate and easy market research for what to put on your page in the future (if zero likes on a inspirational stuff, but crazy shares and comments on every single funny meme, then you have struck some gold for yourself!). Ok, so do you see how frickin’ simple this is? Going back to some of the basics and getting familiar with at old high school friend, Facebook. If you do any of these things and see growth and engagement in your business, please LET ME KNOW! Shoot me an email or share this post!